Everton secured back-to-back FA Women’s Super League Continental Tyres Cup wins with a hard-fought 1-0 victory over Birmingham City on Thursday night. In cold conditions in Widnes, a first-half strike from Courtney Sweetman-Kirk was enough to hand Andy Spence’s side top spot in Group Two North. The hosts started brightly, with skipper Danielle Turner firing just wide of the target on 10 minutes after a forceful run forward from defence. The Blues only had to wait another two minutes to take the lead through Sweetman-Kirk’s composed finish. A long ball forward fell kindly for the striker and she showed excellent control before lofting the ball over the advancing Ann-Katrin Berger. Birmingham struggled to create any clear-cut chances in the opening 45 minutes – Lucy Quinn provided the majority of their attacking threat from out wide but her cross-shot on 27 minutes was the closet the visitors came to a breakthrough. The second half began in similar fashion to the first, and Everton almost extended their lead just a minute after the restart. Sweetman-Kirk found space in behind the Birmingham defence but her close-range effort was bravely stopped by Berger. Birmingham improved as the second half wore on, with Quinn at the centre of the action again. First, her swerving effort from the edge of the area was well-saved by Kirstie Levell on 81 minutes before her curling strike flew inches wide of post two minutes later. 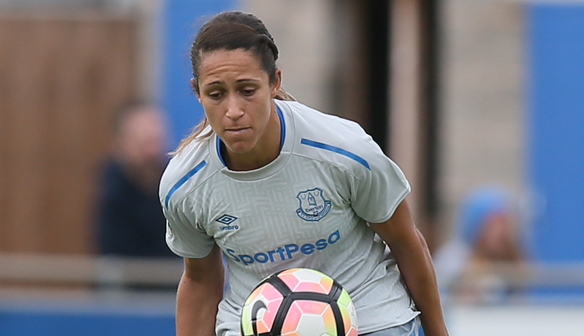 Everton’s Chantelle Boye-Hlorkah said: “Overall, we did well and we managed the game well and we got the early goal. “We’ve shown against the top teams [this season] that this performance has been coming. “We’ve performed well but we've just been lacking goals – but we created chances this time and lucky enough, we got a goal. “We did well in the second half. We had spells where we could have done better but we managed the game well. Birmingham City’s Lucy Quinn said: “Obviously, we are all gutted. The manager isn't happy with how we played or the end result. “We knew it would be tough to come and play up here but we didn't do what we planned to do and that shows in the result. “At half-time, the manager was brutally honest with us and he told us it wasn't good enough, and he drilled that message in.